﻿﻿South Padre Island offers aquatic adventures and wondrous views. ﻿﻿On this barrier island off the south tip of Texas, it’s all about the water. The shallow, salty Laguna Madre bounds South Padre Island on one side, and the warm, mellow Gulf of Mexico on the other. I came to take full advantage of both. I kicked off my watery weekend with a sunset dinner cruise on the Southern Wave. My friends and I boarded the enormous catamaran behind Louie’s Backyard, along with about 12 other guests, many bearing coolers of their favorite beverages. As we glided through the glassy bay, we were served grilled shrimp, fajitas and fresh fruit. A guitarist added live music, and the bay and houses along the shore offered plenty of scenery. We had front-row seats for the spectacular show created when a giant orange sun set, its rays painting sky and water alike. I then checked into Schlitter­bahn Beach Resort, pleased to land a room overlooking the Gulf. The original hotel on this spot suffered at the hands of Hurricane Dolly and sat vacant until 2011, when Schlit­terbahn completely remodeled it. The 221-room property now boasts furniture made by the company’s craftsmen in New Braunfels, using wood from loblolly pines and other trees killed by the 2011 Bastrop area fires. The resort has its own heated, indoor, year-round water park and is next door to the outdoor water park. In short, lots of water. 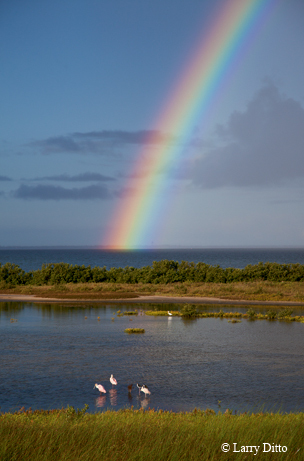 ﻿A rainbow touches down in the waters of the Laguna Madre. After breakfast the next morning at the hotel’s Seaside Grill, overlooking the beach (can’t get enough of that view), I headed to Sea Turtle Inc. Founded in 1977 by “The Turtle Lady,” Ila Loetscher, this nonprofit rescues and rehabilitates sea turtles and educates the public about these endangered reptiles. It aims to release turtles back to the wild, but severe injuries mean permanent residency for some turtles, including Allison, who had only one flipper and became the first sea turtle to successfully use a prosthetic. These turtles help the public and school groups learn how injuries occur in the wild and how they can be prevented. From April to August, Sea Turtle’s staff and volunteers patrol South Padre beaches for Kemp’s ridley nests, taking eggs into a protected corral for incubation. In the 2012 season, 72 nests were found, one containing 139 eggs, a state record. (Public hatchling releases take place June to August, at 6:30 a.m. at County Beach Access 3; estimated dates are posted on Sea Turtle Inc.’s website, but call (956) 433-5735 at 6 a.m. to confirm.) My visit didn’t coincide with a release, but videos on the website are almost as good. The gift shop carries unique items made in communities historically dependent on sea turtle poaching, providing locals with an alternative income. I bought nifty souvenirs for my kids and helped protect sea turtles at the same time. Next stop was the South Padre Island Birding and Nature Center, one of nine World Birding Center sites scattered across the Rio Grande Valley. Exhibits on the second floor cover the formation of barrier islands and the island’s ecosystem, including a floor-to-ceiling tank re-creating an offshore platform reef environment and models of 49 species of fish and invertebrates. Outside, 4,800 feet of boardwalk, a five-story birding tower and seven bird blinds make it easy to spot herons, ibises, roseate spoonbills, rails, egrets and — depending on the season — warblers, tanagers and thrushes. I even saw an alligator. If you want more nature, options include dolphin cruises, the nearby Laguna Atascosa National Wildlife Refuge and the University of Texas-Pan American Coastal Studies Lab in Isla Blanca Park, which has aquarium displays and an extensive shell collection. 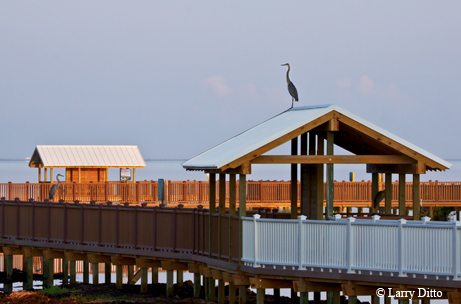 ﻿﻿Boardwalks make it easy to spot birds at the South Padre Island Birding and Nature Center. For lunch, I enjoyed what is billed as the island’s best beach cheeseburger (no argument from me) at Café on the Beach at the Palms Resort, which has — you guessed it — a great view of the beach. Then I headed for a sand castle building lesson with sand castle master Andy Hancock behind Boomerang Billy’s. A jovial transplant from England, Hancock is a master with a straw and a pencil, two essential if unexpected sand castle tools. His lessons unfold under a shade tarp amid a half-dozen large barrels topped with sand (building castles while standing up saves the back and knees). Under his careful tutelage, almost anyone can transform a large chunk of sand into a stunningly detailed castle or some other creation. When the lesson ended, I relaxed on the beach, watching folks on surfboards and kiteboards taking advantage of the island’s ever-present wind and waves. Both activities looked tempting, and I did make time for a dip in the Gulf, but kayaking was next on my list of fun in the water. 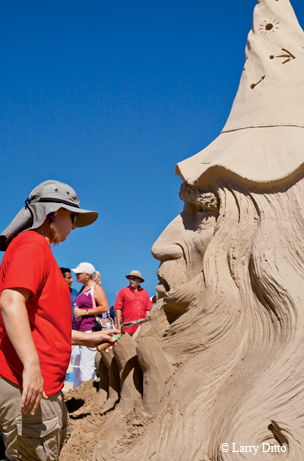 ﻿﻿Sand castle masters transform large chunks of sand into stunning creations. South Padre Island Water Sports and Air Padre Kite­boarding, two establishments in one building, rent surfboards, kiteboards, stand-up paddle boards and kayaks. I took a leisurely paddle through channels lined with impressive homes and out into the bay, where I could look through my boat’s glass bottom at fish in the seagrass below. After washing off the sand and saltwater back at my hotel, I headed across the street to Pier 19, which stretches out over the water behind the KOA campground next to a fishing pier. The specialty is local, wild-caught seafood. I ordered six oysters on the half-shell and a seafood po’boy made with fresh grouper, and then took a stroll down the boardwalk to the palapa bar at its end to look for dolphins and take in another gorgeous sunset. The Laguna Madre covers more than 600 square miles, stretching from Mexico to the northern tip of North Padre Island. Originally one 100-mile-long barrier island, Padre became two when the U.S. Army Corps of Engineers dredged the Mansfield Channel to create access from the Gulf to Port Mansfield and the Intracoastal Waterway. With no major rivers flowing into it, this sprawling estuary is hypersaline (saltier than the ocean). It’s one of only six such environments in the world. The average depth is 2.5 feet, with maximum depths of about 5 feet, supporting marshes, algal flats and some 80 percent of the remaining seagrass habitat in Texas. All of this creates excellent fishing grounds for spotted seatrout, redfish, black drum and flounder. The bay offers incredible access as well. No need for a guide or boat — just wade out from the shore and cast your line. If you prefer a shady seat and cold beverages at hand, charters that ply the bay are available, and, if nothing is biting there, they will head out to the jetties for gray snapper and Florida pompano. After an early morning fishing outing, I headed to the north end of town and South Padre Island Adventures, which most of us know as Horses on the Beach (it offers other adventures as well). The wrangler set me astride a handsome bay horse with a white star on her face. Rides are escorted, but not the standard nose-to-tail line typical of many stables. My steed and I trotted along with a group, splashing into the water occasionally, pausing to watch pelicans land and enjoying the wind through our respective manes. I rode for an hour, but one-and-a-half-hour early morning rides and one-and-three-quarter-hour sunset rides are also available. On my way home from this island getaway, I made one last stop, just across the causeway in Port Isabel, to climb the historic lighthouse. The only lighthouse in Texas still open to the public, it affords a nice, 360-degree view of the bay and a wistful look back at the island and the shimmering Laguna Madre.